Summer brings my favorite foods. Succulent corn on the cob, pints upon pints of Hayton Farms strawberries, blueberries, and raspberries, flame-roasted Hatch peppers, and lettuces all bigger than my head. My 5,000 square foot city lot just isn’t big enough to grow many foods, so I count on my local farmers markets for most everything since I only nurture tomatoes, green beans, and Italian prune plums. Whether from my yard or from the farmer, I know the food is as fresh as it can be. It’s not stored in a warehouse for weeks nor traveled thousands of miles to my plate. Even though unprocessed, raw food appears to be fresh, only recently has my palate been discerning the subtle difference between just picked or foraged food and grocery aisle produce. Just because a pint of blueberries appears to be fresh–bright plump berries, with a little sheen–it doesn’t mean that they were just picked. A head of lettuce may be vivid green, but its connection to the earth may be drab tan indicating its days or even weeks old. One of my favorite famers Steve Hallstrom of Let Us Farm of Oakville, Washington, travels the Interstate 5 corridor every Saturday from May until November, leaving the farm at 5 a.m. to bring the largest selection of delectable lettuces to his loyal clientele at the University District Farmers Market in Seattle. Talk to other purchasers at the market and they agree Let Us Farm grows the best. Located in a rural Grays Harbor County on the Chehalis River floodplain, Let Us Farm practices sustainable, organic farming including intentional crop rotation. By allowing a portion of their 80 acres of fields to go fallow regularly and planting them with a nitrogen fixing legume, the soil is nourished again for subsequent yearly plantings. Steve and his wife Cecelia live on the farm and have had many interns rotate through their farm operation to learn the agricultural trade. As with any profession, it takes at least ten to 15 years to become a master and every season there is still more to learn. Every growing season is different, too much rain or too little, lots of sun or not enough, and a late spring or an early fall. Despite the vagaries of the seasons, Steve has accomplished the art of lettuce growing, eschewing herbicides and pesticides in keeping with the organic standards. 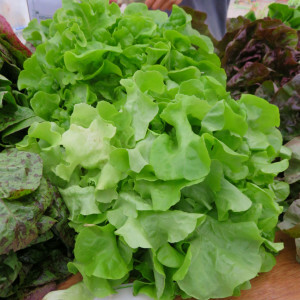 One choice variety is Galisse, a leafy, lobed, sweet, vibrant green lettuce perfect for salads and sandwiches. The head is as large as a basketball and even with four hungry eaters lasts for two or three meals. Being a thrifty Yankee, I am compelled to buy 2 heads for $5 rather than one head for $3 purchasing Bronze Arrow, Esmerelda, or a bunch of spinach. Still, sometimes, two heads is more than my family can eat quickly and I store it in my own personal warehouse, the refrigerator. This happened recently, where a Let Us Farm Galisse spent two weeks in the vegetable bin, while I was on vacation. Once home the lettuce still appeared healthy, vibrant, and just as fresh as the day I purchased it, so, I used a leaf to top a sandwich. Only I knew it was two weeks old! It still tasted okay, but definitely not as good as when I first bought it. Instead of a crisp, juicy, sweet leaf, with flavor just popping in my mouth, it was a smidgen bitter and a tad bit dry. It got me to thinking how old are the lettuce heads I purchase at the grocery store? Usually Romaine is my top choice, as it is the healthiest variety that is sold at a mainstream store or the co-op year around. Even so, Romaine is often bitter and dull-looking. If my Galisse looked so good after my personal warehousing, how fresh is the grocery store Romaine? Once picked, fruits and vegetables begin their demise, which can be thwarted by chilling, freezing, canning, and other preservation methods. Sugars begin to naturally oxidize, especially when produce is stored in heat or humidity. Fruits and vegetables respire after harvest causing biochemical changes resulting in a breakdown of the carbohydrates and the production of carbon dioxide and methane. Further, fresh food flavor is unpredictable because of its unknown travel or warehouse life preceding its arrival in the produce aisle. Additionally, the varying growing conditions such as watering schedule, sunlight hours, and cool versus warm temperatures can vary the produce taste causing the finicky eater to shun the healthiest foods, just because they don’t taste the same every time. Any delay from farm to fork and just the unpredictability of Mother Nature can be enough for food flavor to change from sweet to bitter or vibrant to bland. No wonder it’s hard to get people both young and old to eat their fruits and veggies. And for some it’s McDonald’s fare, because it is so predictable! 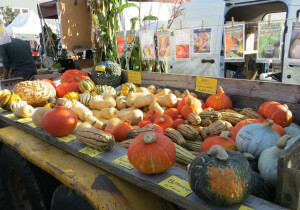 One solution to this disconnect with food tasting differently season to season or week to week is to bring food growing back to the people. I’m not suggesting that we all have Victory Gardens as during WWII, but instead that housing developments are built that are landscaped with orchards, berry shrubs, and community gardens. We all eat, but as a society, most of us have forgotten where our food comes from. It’s not Albertsons, Stop ‘n Shop or Publix, but rather a farm. And on the farm, food grows in the ground, or on a bush or in a tree. By integrating food production into our communities, we can develop neighborliness around nourishment from the earth’s bounty. We need to reconnect with truly fresh food, so we know how good it really tastes! It’s true. Berries fresh from some vendors are the best. The Bellevue Farmers Market had a vendor last year that came from eastern WA with blueberries picked the same day. I always bought as many as I could. Kathryn, Your inventory of the goodness and complexity of what goes into creating good tasting foods was excellent reading and good information for us all. I am far from a market most of days they are happening so I have been buying from organic grocers and have felt sort of blah about what I have been eating. But your story points out the real value of shopping from farmers who harvested their produce the day before-nothing tastes better than really fresh. I think we can find new shoppers to our markets through the idea that taste is uncomparable when we buy fresh and the place to get it is at farmers markets!